Every day seems to stitch tighter and tighter together schedule-wise. We have less time to relax, and have to find solace in little moments throughout the day. Sometimes, the daily rituals we do are enough to calm our minds, and help us wake up or go to sleep. While coffee is known to be a big part of our mornings, it also plays a role in our evenings as well since we have to set up the coffeemaker for the next day. If the smell of hot coffee is enough to rouse you from slumber, and you happen to love vintage aesthetics, then you’re going to love the Barisieur. 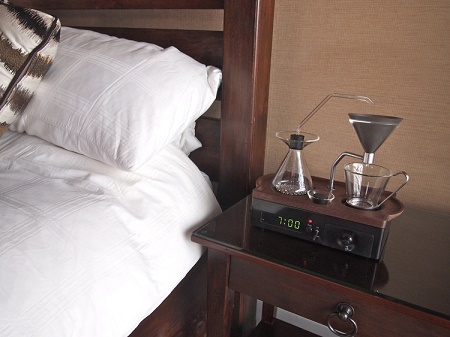 This alarm clock will wake you through the subtle movement of the stainless steel ball bearings that will boil the water for your morning fuel. There’s a compartment for your sugar, grounds, and a vial for your milk, so you can have your first cup before your feet even hit the floor. This $200-330 purchase is certainly not for the average Joe Schmoe. This is still in the works, and is not currently available, hence the range of price. You will need to have a fair deal of disposable income, or have the world of coffee and the products that surround it be your only hobby to justify dropping this kind of dough on this dual-function machine. It would be slightly more annoying to clean out the grounds as you’ll still have to make a trip to the kitchen every day, but the visual enhancement/instant coffee-in-bed aspect might even out the annoyance.